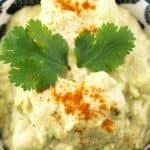 Avocado hummus? Filled with avocado, chickpeas, cilantro, lemon, cumin, garlic, spicy chili pepper, sesame seeds and olive oil, this is a delicious spin on a classic recipe! 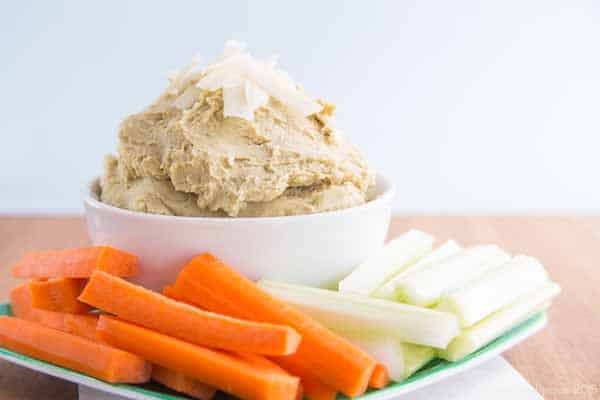 Avocado hummus is the perfect healthy appetizer to serve with fresh vegetables or crackers. It’s Alix and Hugo from A Hedgehog in the Kitchen, back again to share one of our favorite healthy recipes with you! We cook lots of international recipes in our Parisian kitchen and with all of the snow we’ve been having, we’ve been spending even more time than usual cooking cozy and tasty recipes. At the moment, we are loving this creamy Thai broccoli carrot potato coconut curry, this exotic Burmese chicken curry with turmeric and ginger and this cheesy French tartiflette. Coconut milk, cheese, veggies, spices … Our kitchen smells amazing! 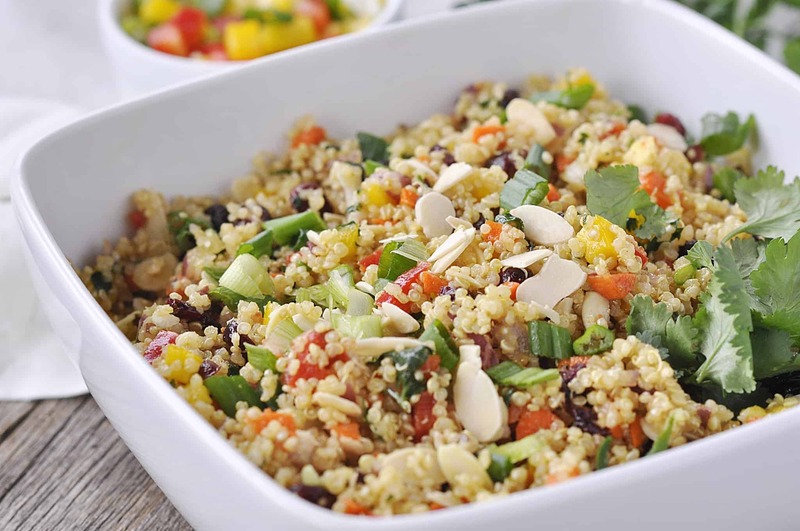 Today we are sharing a recipe you are sure to love! It is simple, yet unique, and healthy as well. 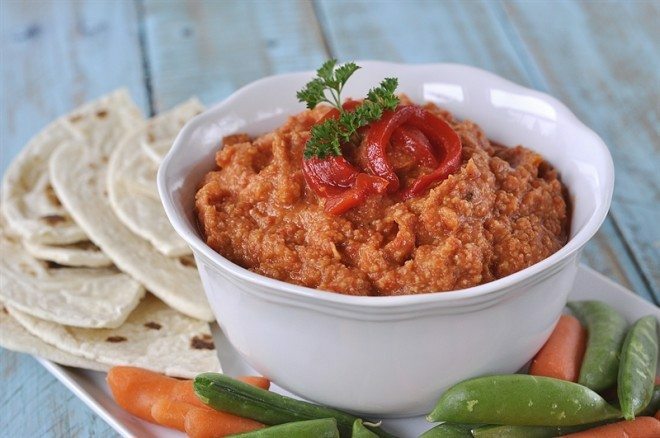 It is the perfect dip for your next cocktail party, a welcome addition on top of your favorite salad, or a healthy mid-afternoon snack. 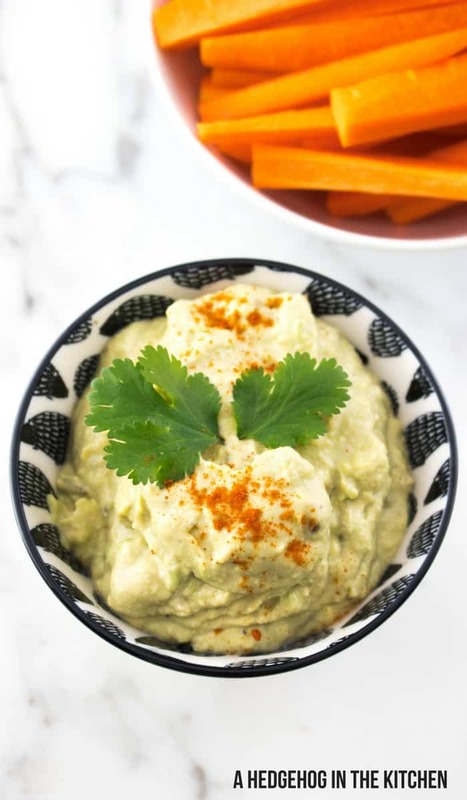 This avocado hummus is about to elevate your life! We recommend making homemade tahini, but if you don’t have the time, you can replace with store-bought. Avocado hack – cut the inside of the avocado several times length wise and then several times width wise. This will make it so much easier to just scoop out the inside with a spoon to mash, rather than scooping out the avocado and then cutting it up into lots of little pieces when it is outside of its skin. Make sure to use fresh cilantro in this recipe for maximum flavor! Lemon tip – to make it easy to squeeze all of the lemon juice out of the lemon, roll the lemon along your countertop, making sure to roll all sides of the lemon, before cutting the lemon open. Avocado tip – to check to see if your avocado is ripe, squeeze it gently. It should yield slightly if ready to use. We made this when we had friends over recently. We served it with grainy baguette and carrot sticks for dipping. It was a hit! We love entertaining and think it’s important to have some easy recipes up your sleeve for when you host. If you love simple recipes for entertaining too, come check out our French salmon mousse, our Indian raita and our Greek yogurt dip with orange and honey. 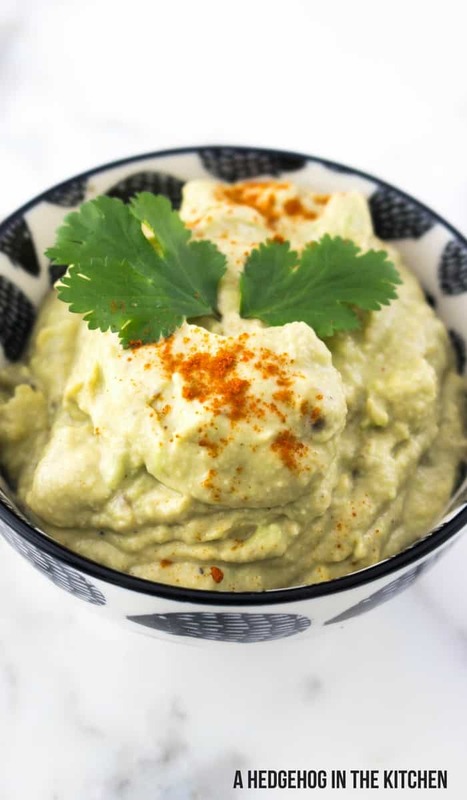 Avocado hummus is a combination of tasty and healthy ingredients : avocado, chickpeas, cilantro, cumin, garlic, spicy pepper, sesame seeds, lemon and olive oil. 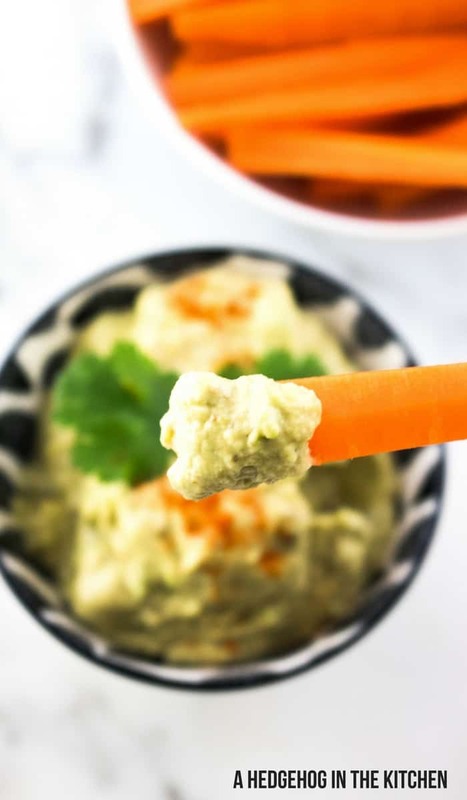 Avocado hummus? Filled with avocado, chickpeas, cilantro, lemon, cumin, garlic, spicy pepper, sesame seeds and olive oil, this is a delicious spin on a classic recipe! Mix sesame seeds and olive oil with a hand blender for 4-5 minutes until smooth. Pour the chickpeas into the mixture and blend. Add the garlic clove, lemon, chili peppers and keep blending. Add the yogurt and blend again until the mixture becomes smooth. Add the avocado, salt, black pepper and blend. Pour the mixture into a bowl, sprinkle with chili pepper and top with fresh cilantro. Serve with carrot sticks and grainy baguette (or other favorite bread). Alix & Hugo Strickland Frénoy are a married couple, recipe developers, photographers and lifelong explorers. They created A Hedgehog in the Kitchen to share their passion for healthy, French & International recipes and to inspire you to make simple and delicious homemade food. They also share Parisian restaurant and hotel recommendations as well as their travel adventures on the blog. The blog is home to 200+ articles featuring farm to table recipes, free meal plans & printables to help you become a better homecook and travel recommendations to help you experience Paris and abroad like a local. Sign up to receive 2 free recipes per week as well as food travel tips gathered from our adventures. 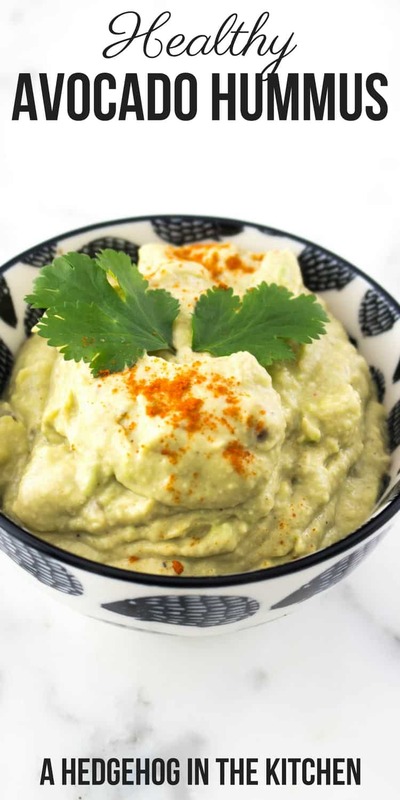 If you liked this Avocado Hummus recipe you might also like…. From left to right: Roasted Broccoli Cheddar Hummus, Roasted Red Pepper Hummus & Cranberry Quinoa Salad.